Phantom 4 feature bay at an Apple Store. Via DJI. Apple is promoting the new flying camera with a large "feature bay" display featuring signage and a hands-on Phantom 4 drone and controller. Boxed units and accompanying accessories are also on display on the store floor for purchase. Of course, third-party products that tie into the Apple ecosystem are found throughout Apple's stores. But the feature bay allocated to the DJI Phantom 4 represents a new level of promotion for a non-Apple product. 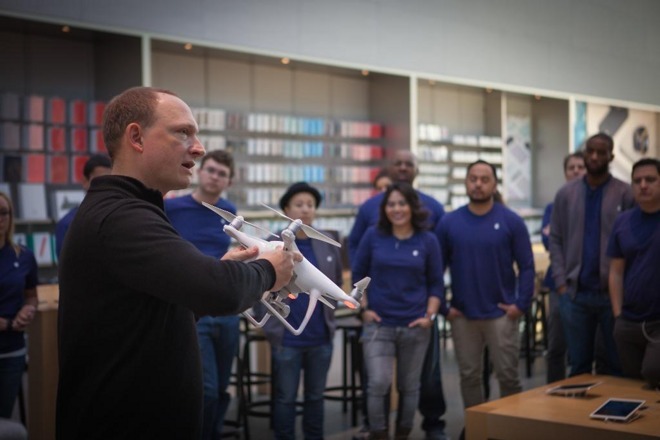 DJI representatives have also visited select Apple Stores to give hands-on training sessions with the Phantom 4. The drone is currently available at more than 400 Apple retail locations around the world. 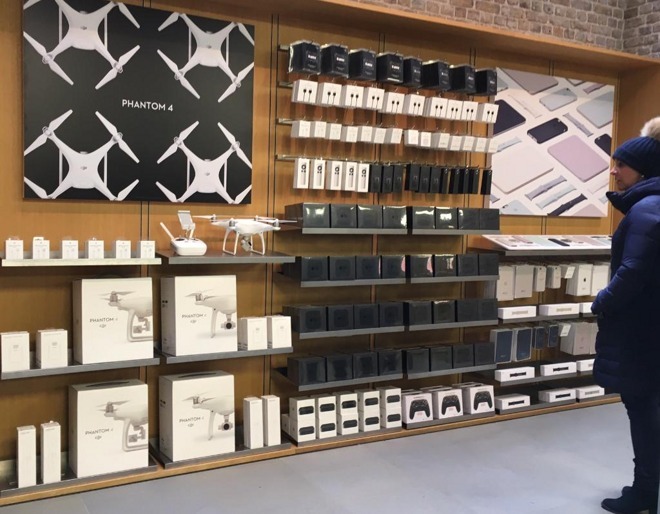 Phantom 4 in-store training session. Via DJI. Apple is the exclusive retail partner with DJI for the launch of the Phantom 4, though it will expand to other resellers in the coming weeks. In unveiling the new model earlier this month, DJI director of strategic partnerships Michael Perry explained that most of his company's customers already use Apple products. The company's prosumer-focused line of Phantom drones integrate tightly with Apple's iOS ecosystem, allowing users to view and even control their drone via an iPhone or iPad. Priced at $1,399, the Phantom 4 features advanced autopilot, auto-follow and object avoidance capabilities thanks to new cameras and sensors. Using an iPad or iPhone, users can select an object on screen that they want the drone to follow, and the Phantom 4 will automatically track and follow it intelligently avoiding obstacles.